From the Objectivists to e-poetry, this thoughtful and innovative book explores the dynamic relationship between the ethical imperative and poetic practice, revitalizing the study of the most prominent post-war American poets in a fresh, provocative way. Contributing to the "turn to ethics" in literary studies, the book begins with Emmanual Levinas' philosophy, proposing that his reorientation of ontology and ethics demands a social responsibility. In poetic practice this responsibility for the other, it is argued, is both responsive to the traumatized semiotics of our shared language and directed towards an emancipatory social activism. Individual chapters deal with Charles Olson's The Maximus Poems (including reproductions of previously unpublished archive material), Gary Snyder's environmental poetry, Allen Ginsberg's Beat poetics, Jerome Rothenberg's ethnopoetics, and Bruce Andrew's Language poetry. Following the book's chronological and contextual approach, their work is situated within a constellation of poetic schools and movements, and in relation to the shifting socio-political conditions of post-war America. 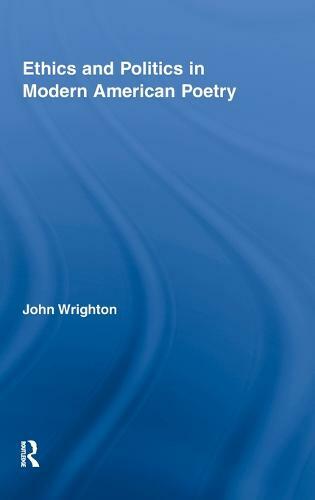 In its redefinition and extension of the key notion of "poethics" and, as guide to the development of experimental work in modern American poetry, this book will interest and appeal to a wide audience.